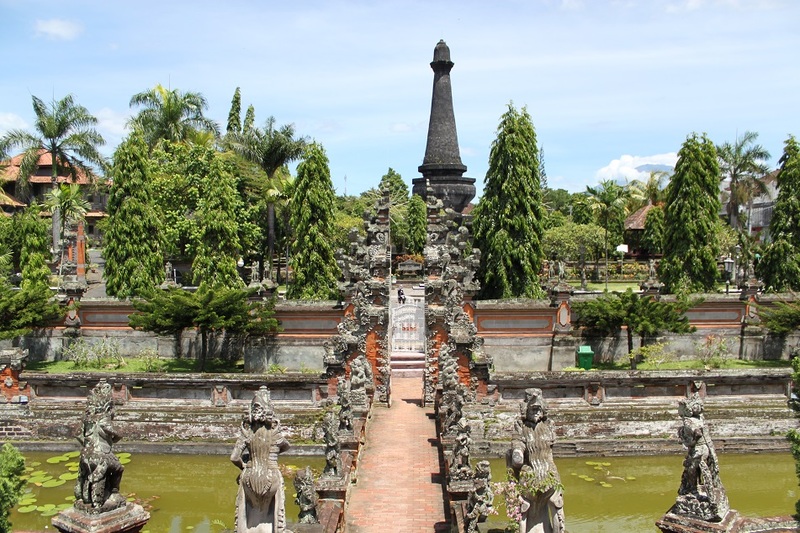 Revisiting Bali’s Spiritual Monuments | What an Amazing World! A girl in Balinese traditional sarung for woman puts canang sari – a small basket of woven palm leaves filled with colorful petals and shredded pandan leaves – on the ground, then sprinkles holy water on it, puts some incense sticks made from the fragrant cempaka flower or cendana wood, and finally makes a circle in the air with her hand above the offering with a frangipani tucked between her fingers. Life intertwines with spiritualism on this island of gods, dictating everything from birth to death. 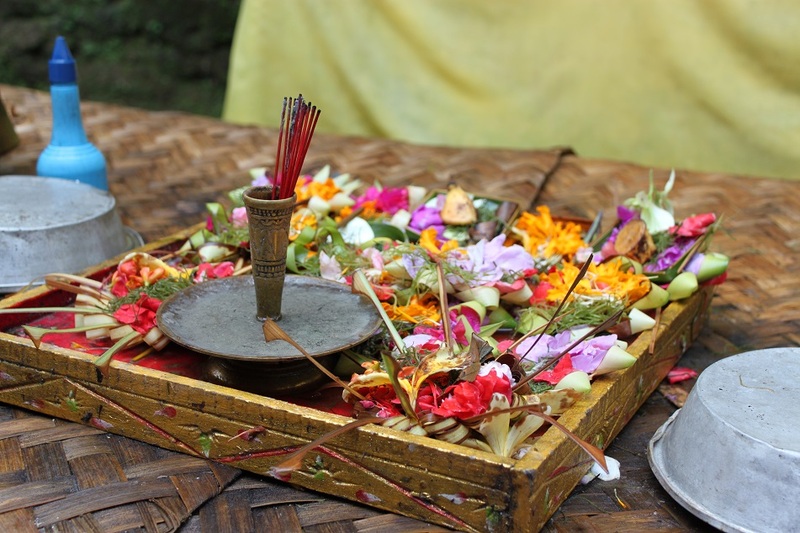 Reflected on their rituals and traditions, also the profusion of puras throughout the island – from mountain slopes, forests, cliffs, swamps, lakes, to villages and cities – Balinese takes their religion – an elaborate blend of Hinduism and animism – very seriously, which in turn creates a unique cultural landscape, exotic and sometimes peculiar to outsiders. Goa Gajah was once a center for Hinduism and Buddhism teachings during the rule of Warmadewa dynasty from the 10th – 14th century AD. 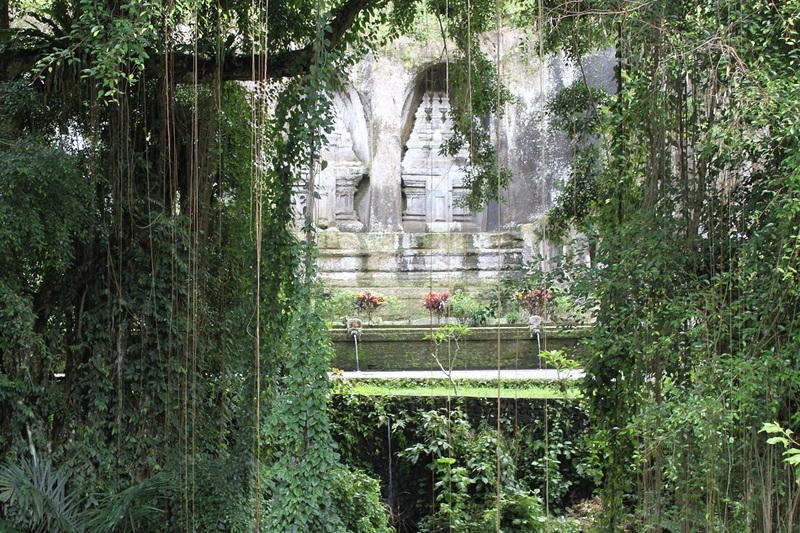 The kingdom – one of the mightiest in Balinese history – used it as a monastery for Hindu priests as well as Buddhist monks, indicating similar interfaith harmony as occured in Java during the height of Medang Kingdom centuries earlier. Spanning a period of more than half a century, the excavation which started in 1923 discovered an ancient temple compound bearing Hindu and Buddhist decorative elements. “When they discovered the ruins of the temple, a group of elders asked the ‘spirits’ whether ‘they’ wanted the temple to be rebuilt or not,” Bli Komang tells me. “But ‘they’ wanted this part to remain untouched,” he continues while pointing his finger to a group of ruins. 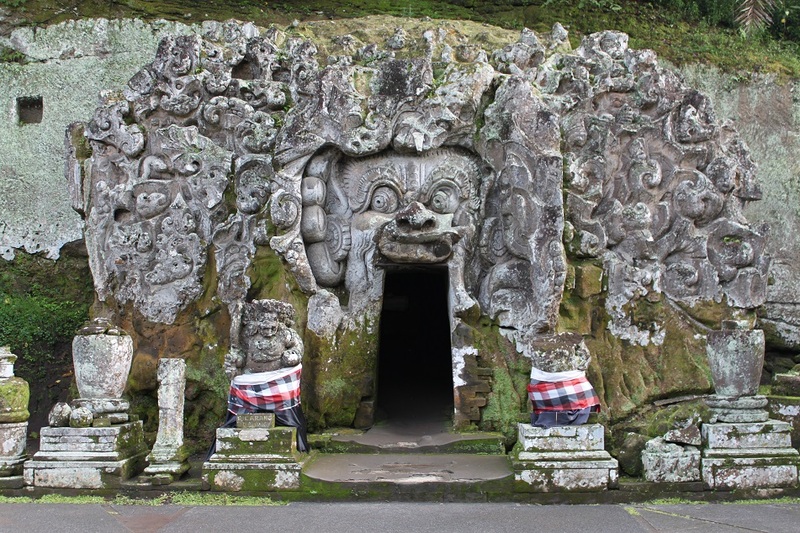 The main section of the temple compound is a small cave whose entrance is decorated with intricate stone carvings of a demon-like creature, pressumably the guardian of the sacred cave. 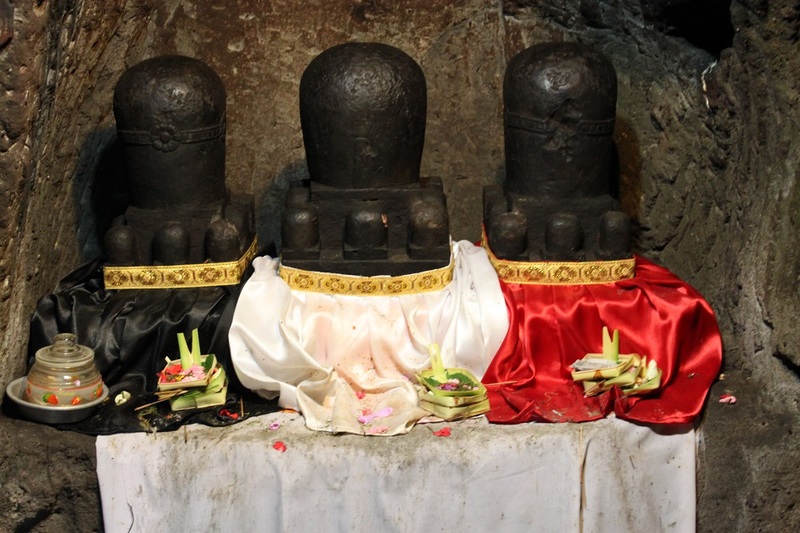 Three linggams – phalic stone statues – rest inside it, symbolizing the three main Hindu deities: Brahma the creator, Vishnu the preserver and Shiva the destroyer. 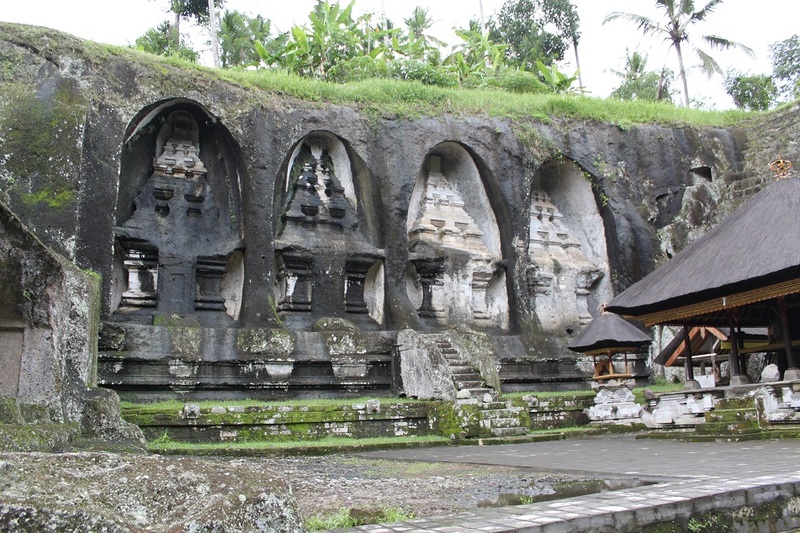 After long lost beneath the Earth’s surface and abandoned, today Goa Gajah once again holds an important role in local residents’ religious activities. 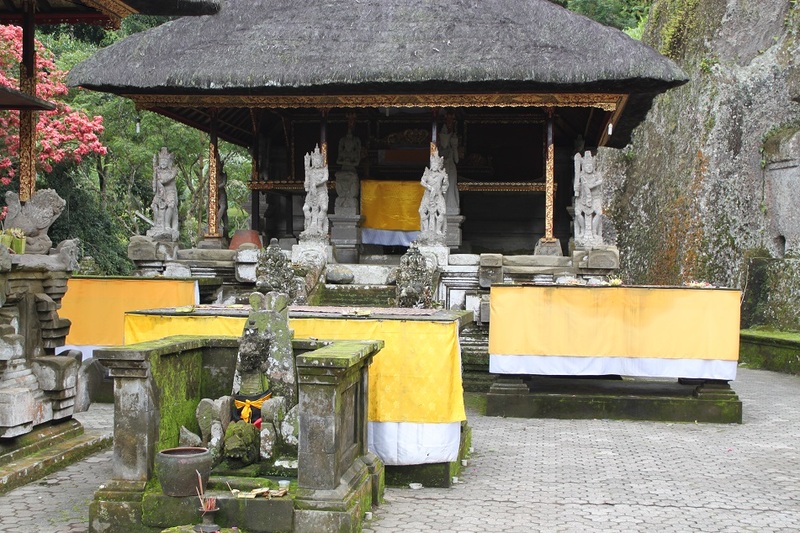 For Balinese life revolves around old custom and religion, and Goa Gajah – or Pura Goa (Cave Temple) as locals call it – is right at the heart of the village’s spiritual universe. Even in a deeply religious society there were those who fell into the dark side of life. 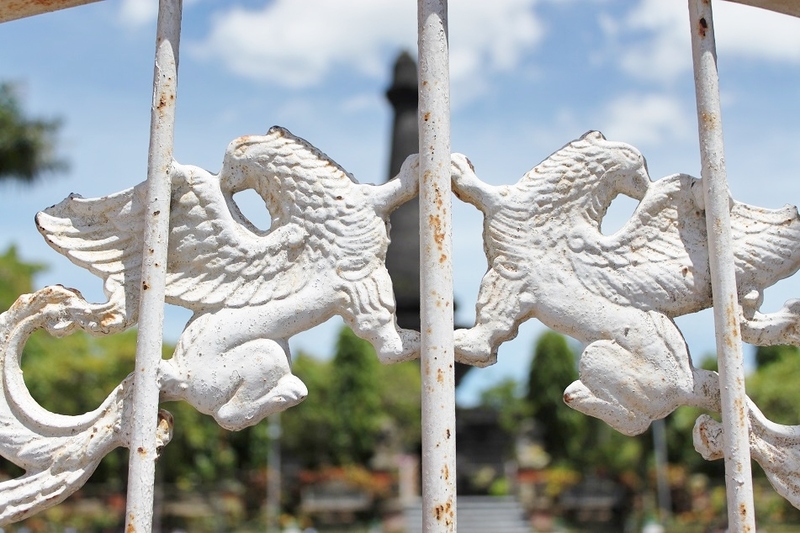 Kerta Gosa was Bali’s most respected court of tribunal in the 18th century, providing justice by resolving even the most difficult and complicated cases on the island. Today Kerta Gosa is no longer used to try perpetrators and had been replaced by a modern court under the Indonesian civil law system. Nevertheless the jewel of its pavilions remains: painted ceilings depicting punishments in afterlife for conducting bad deeds as well as the results of karma. 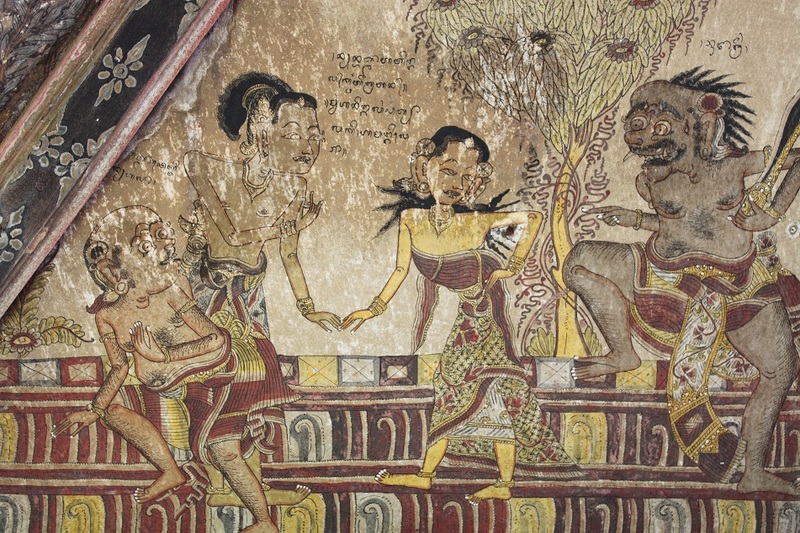 Bli Komang points at one section with a man and a woman holding hands, watched by two ugly creatures. “Did you cheat on your spouse?” he translates the Balinese script on the panel, explaining about a question cheaters would be asked in the afterlife. Other panels depict harsher consequences for grave crime. 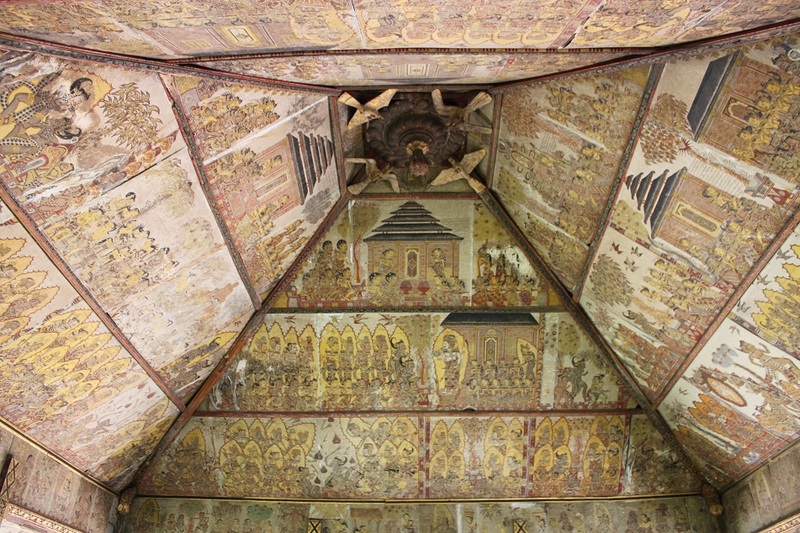 Despite no longer in use, the ceiling paintings of Kerta Gosa still act as a reminder for the locals to always perform good deeds in life, thus maintaining harmony and order in the society. Ngaben is a unique Balinese cremation ceremony where a deceased person is placed inside a coffin which is inserted inside an buffalo-looking sarcophagus. It is performed to free a person from his worldy restraint, i.e. his body, in order his purified spirit to be able to reach his final resting place. From those who belong to the lower caste of the society to those of brahmana (priests) and ksatria (kings) are subject to be cremated, only the cost of the cremation that differs the one from the other – the most expensive Ngaben was estimated to cost more than US$ 80,000. 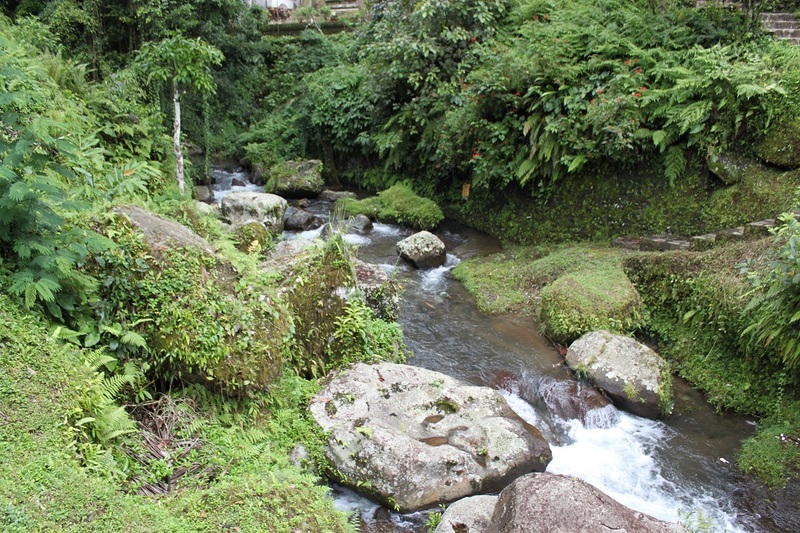 However, contrary to the normal custom where no tomb is dedicated for a deceased person, Anak Wungsu – literally means the last son – of Warmadewa dynasty built shrines at the scenic Pakerisan Valley for honoring his parents and older brothers. Hidden amid the lush Balinese tropical forests and rice paddies, Candi Gunung Kawi stands graciously against Pakerisan River, immortalizing Anak Wungsu’s love for his family. 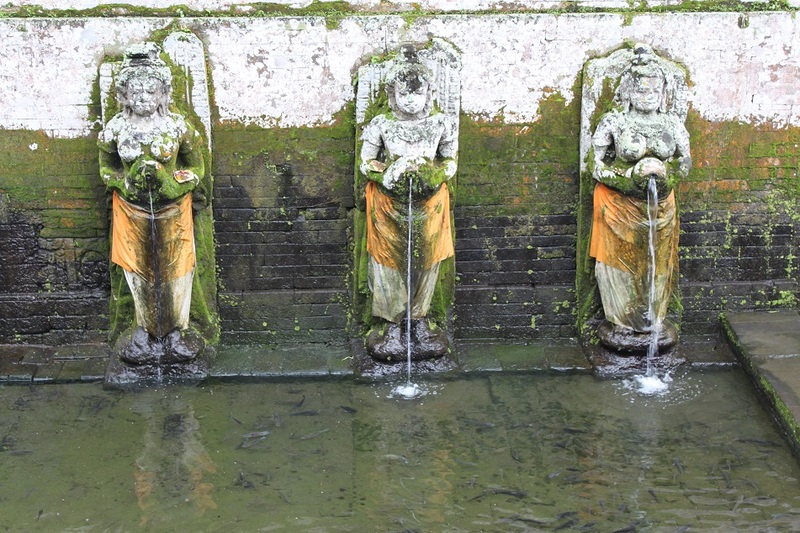 Flowing downstream from its source at Pura Tirta Empul, Pakerisan River cuts through the compound, dividing the rock-hewn shrines into two main parts. Exuding peace and serenity, it’s a manifestation of Balinese Hindus’ aspiration for moksha, a liberation from the cycle of death and rebirth. 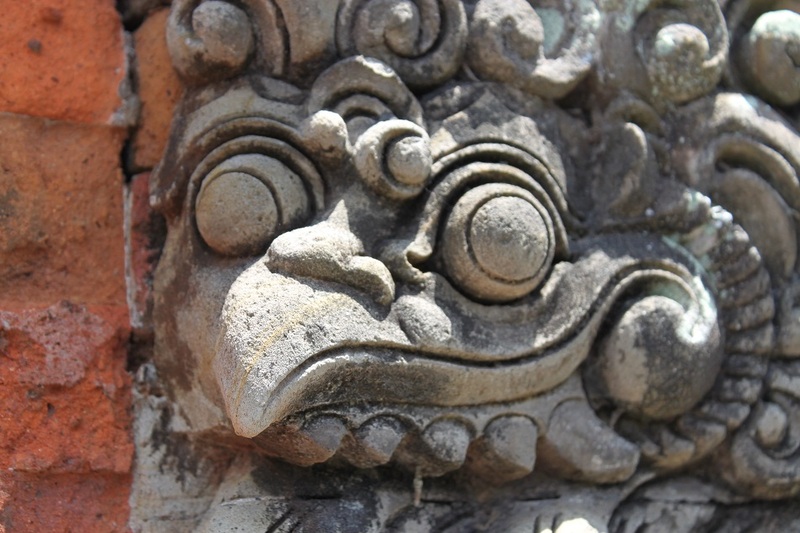 Bali is taking so good care of its shrines and heritage, and it is all so fascinating. That makes it still interesting despite having experienced tourism boom. I must say there is always something appealing and enchanting every time I step on the island. I’ve bern there 5 years ago… Beautiful travel!! Amazing place! Sorry becouse Bali is known only beaches but is Also very interesting in the inside!! Nice to know you’ve seen those places, Nicoletta. You’re right about Bali’s beaches which are often more popular than its cultural sights, even though based on my experience the beaches in the neighboring island of Lombok were far more spectacular. Thanks for reading and I’m glad this post brings back those memories of Bali to you. Wow looks really spiritual place to visit. 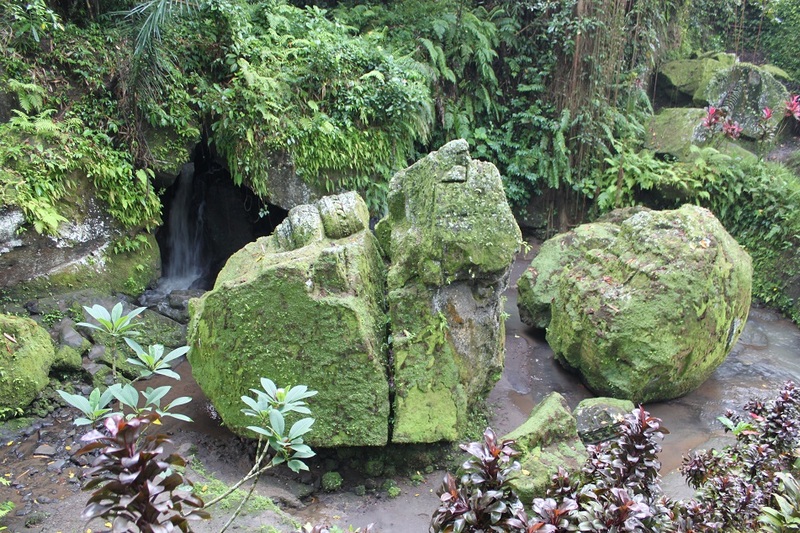 Saya udah dua kali ke Gunung Kawi tapi selalu lupa ke candi yang satu lagi yang terpisah dari kompleks candi utama. Udah pernah ke liat candi itu belum Lim? Kerta Gosa juga menyenangkan, dan lukisan di langit-langitnya menarik, kadang lumayan serem, kadang malah lucu. 🙂 Thanks Halim. Yang letaknya di seberang candi utama dipisahkan sungai? 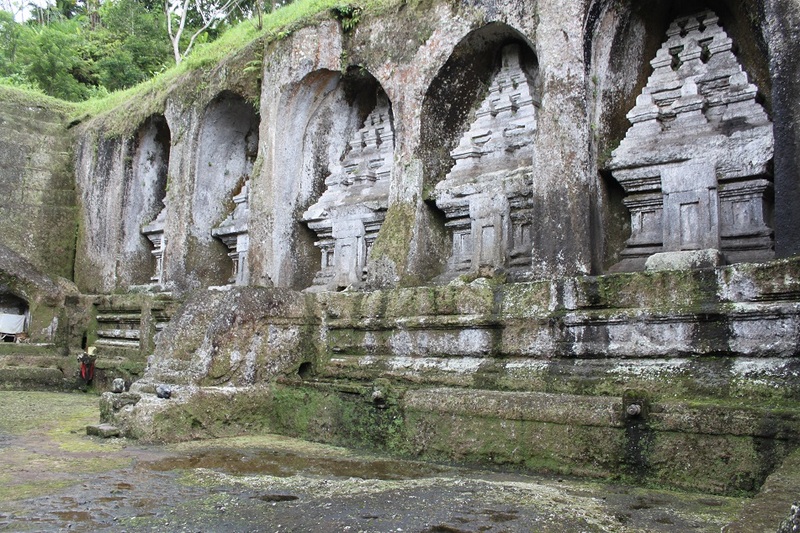 Candi utama jumlahnya lima, kalau yang di seberang cuma ada empat ceruk aja. Bukan, ada satu lagi, candi kesepuluh yang letaknya terpisah dari kedua bagian utama itu. Nanti pas ke Gunung Kawi lagi harus diniatin buat nyari candi kesepuluh itu nih. beautiful! Hoping to make it out to Bali for my next big trip! Hi Liz. Make sure you have more than one week to explore the island! 🙂 Thank you and good luck with your next big trip! Thank you, Meredith. It’s indeed really sad how some Australians had turned Bali’s once tranquil beaches, especially at the southern part of the island, into a one big party scene. Today many people only visited that area and missed the cultural sights the island has to offer altogether. 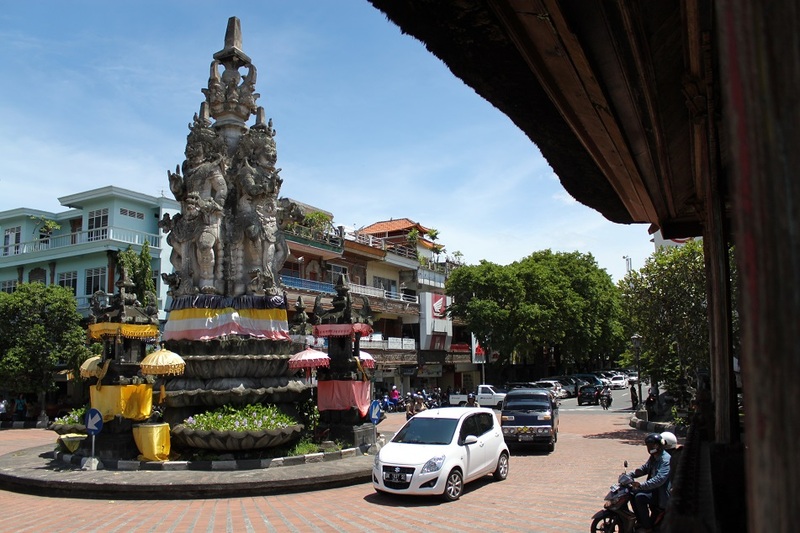 Ubud is changing though, but hopefully it won’t turn into another Kuta in the future. The locals should have learned from what happened to the latter. Bama, I love the way you tied three very different sites together in this one post – well done! Bali is just enchanting and I’m so glad we’re going back soon; you were right when you explained how different it was from Lombok, especially how spiritual it all felt. Thanks James. Finding an idea on how to write about all the three places without too much repeating the same information that I had written in my earlier posts was not that easy. 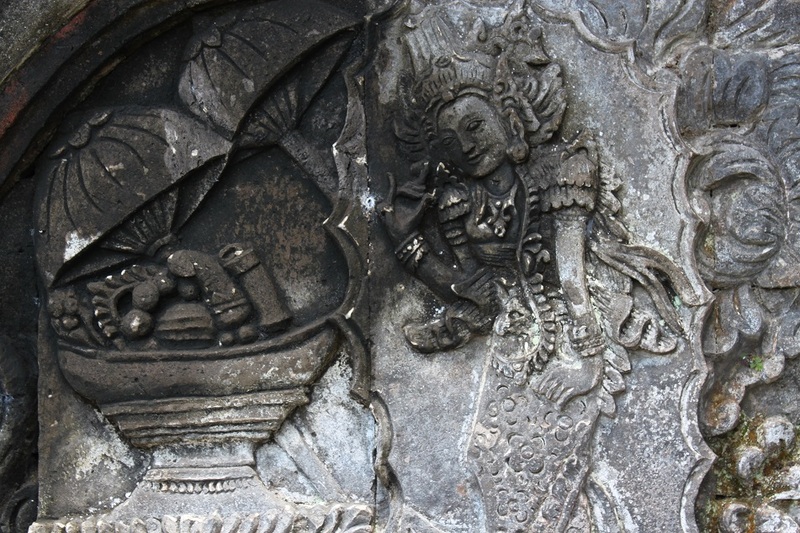 But as is the case with other places in Bali, they are so inspiring that they provide good stories from various angles. Bali’s spirituality is probably the biggest drive for me to keep coming back to the island, and I can’t wait for this June when we will visit it once again. Oh bali dan bali selalu memberi kesan. Thanks sudah berbagi. Bali never fails me, dan banyak orang lain juga. Sama-sama, thanks sudah baca. It is indeed. I suppose you also experienced its unique and colorful culture, didn’t you? Thanks for dropping by, Lucy. Iya, Gunung Kawi yang di Bali ga dipake yang aneh-aneh. Bener-bener tempat bersejarah dan sekarang jadi objek wisata yang udah mulai terkenal. Pernah jadi setting beberapa film luar negeri juga. There are beautiful islands and inspiring islands. Bali definitely falls into the second category. Bama another beautiful glimpse into Bali. In reading the comments I had not known of the concern of the party goers. Your posts create such a peaceful atmosphere it is hard to imagine. That’s why I always avoid the south every time I go to Bali because there are so much to see on the other parts of the island where Balinese culture and landscape are at their best. Thanks Sue! Bama that is incredible. What a powerful piece of writing . Very sad. That is a powerful reminder for us all to be responsible travelers. Terri, that’s really kind of you. I’m humbled. Bali also works the same to me: it keeps pulling me back to visit, again and again. The more I come, the more I fascinating the island and its culture become. In fact next week I’m returning for the 6th time, and this time I’m eyeing on the north of the island which is supposedly one of the least touristed corners of Bali. I love that first photo. The moss really adds an extra dimension. Thanks Julie. The white wall made of bricks, covered in green moss roughly two third from the bottom, and the yellow cloths wrapped around the statues’ waists really made that particular corner eye catchy. Awesome post! I passed by these places, really wonderful! Thank you for the interessant info about cultural habits! Thank you Angie. I’m glad you went to those places because they, together with Balinese cultural landscape, make the island truly one of a kind. 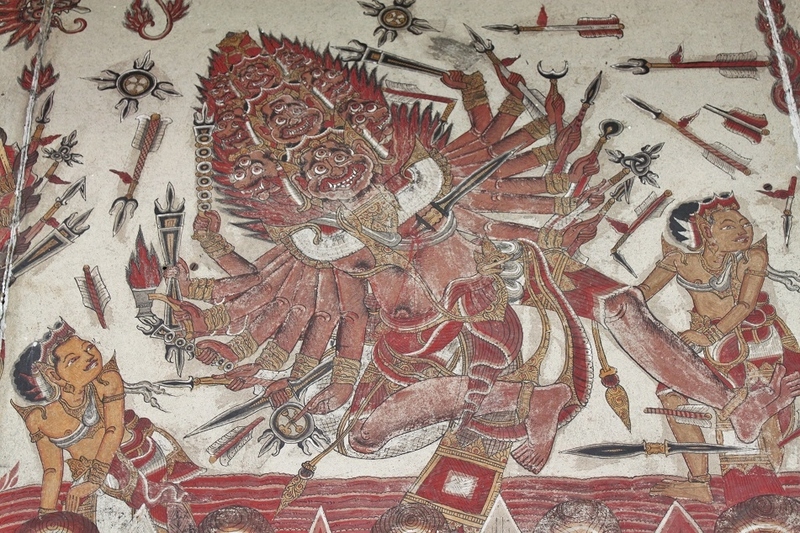 In fact both Buddhism and Hinduism came to Indonesia from India many centuries ago. Despite being a Muslim-majority nation today, vestiges of Buddhism and Hinduism golden era remain widely used in Indonesia. The national flag carrier is Garuda Indonesia, the emblem of one of the country’s most prestigious universities is Ganesha, the mascot for a theme park in Jakarta is Hanoman (Hanuman), and many more. Thank you Ruchi. I’m glad you enjoyed this post. I’d like to find out more about Jainism because up to this day I’ve never met any Jain yet. I have to visit India soon! 🙂 Thank you for your encouragement, Ruchi. Good wishes to you too. Yeah u cud visit India…though I am based in US but still can suggest u places for Jainism….& architectural marvels where I have been…like TripAdvisor….lol…Udaygiri & Khandigiri caves ; Ellora Caves, Madurai City ( South India) full of magnificent temples…Konark sun temple….of course Taj mahal…Qutub minar…. Indian cuisine….u find it in old city markets & stalls….Keep reading & sharing. good wishes. I’m thinking of focusing my first trip to India on the south (Tamil Nadu, Puducherry, Kerala, Goa and Karnataka). But Konark Sun Temple is also on my wish list as I love ancient temples with intricate carvings. Oh well, India is a big country and it will take more than one visit to truly experience it. Thanks for your suggestions! Yeah..absolt…u may need few more trips to enjoy India…Kerala.is my fav fav most fav destiantion from India…dont miss Kumarakom ; Athirapally Waterfall &Munnar from Kerala trip..Athirapally waterfall its like Nigera Falls of India… 🙂 🙂 & kovalam beach….Rameshawaram/kanyakumari….no more suggestions…lol….good wishes. My bucket list include visiting Leh ladakh wenever I visit India…..
All well noted. Thanks a bunch! 🙂 As for Ladakh, it’s also high on my wish list, but probably I will go there on my second trip to the country. I can never get enough of your spiritual tales of Bali Bama. That painted ceiling reminded me of the paintings in the Luxor tombs! Envious that James and you are going back there again 🙂 Can’t wait to read all about your new adventures. Never been to Bali before, but at the sight of your photos, I’m amazed! There’s an awe-inspiring cultural heritage there waiting to be discovered! 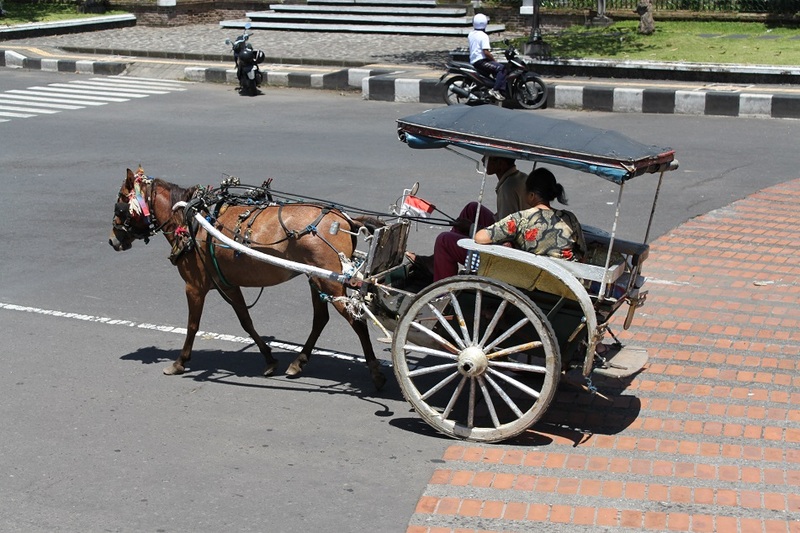 Unfortunately too often Bali is depicted as a once paradise island which is now overrun by mass tourism. 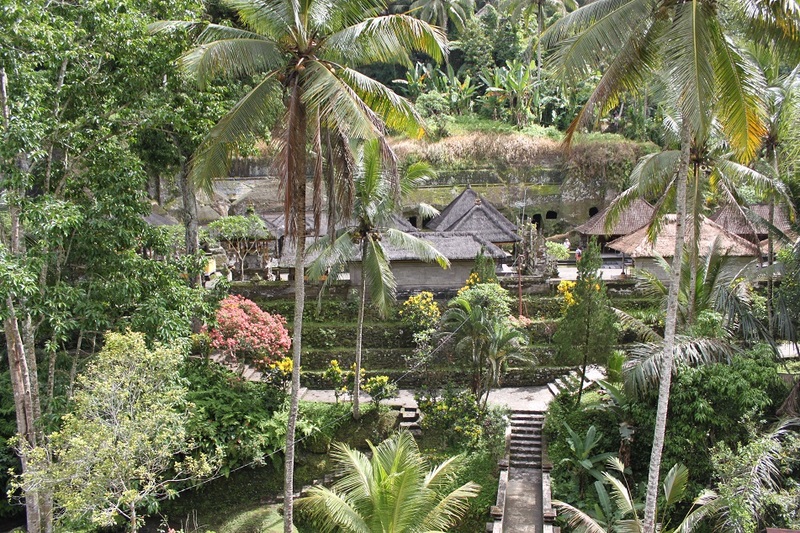 Although that is true to some extent, especially at the southern part of the island, Bali’s real appeal is its unique cultural scenes in a picturesque setting. Balinese are very proud of their culture, therefore I’m quite confident that mass tourism won’t overrun the rest of the island.